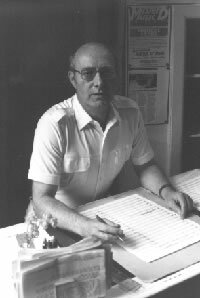 DAVID HELLEWELL, born in Morley, Yorkshire, first made his name internationally as a composer, conductor and performer of avant-garde classical music in the 1970's. In 1969 he formed, as conductor and musical director, APOLLO CONTEMPORARY MUSIC, an ensemble of virtuoso players dedicated to the performance of new music. The ensemble gave many premiers and commissioned new works, with concerts at leading London venues, and in the provinces, and BBC broadcasts on Radio 3's "Music in our Time". He was chairman of the New Macnaghten Concerts (London), and has been a British Council "Visiting Specialist" (Composer) to Hungary. His avant garde work Metamusic for flute and piano, was chosen as the outstanding flute publication of 1976 by the American Flute Association. But at the same time he was also involved with his roots in jazz, rock and popular music, and in fact he composed a whole new genre of music for classical (and in particular for young) musicians during this period - "Mister D" Music, which combined and extended a multitude of sources such as classical, jazz, rock, latin american, baroque, romantic and popular music. This music is now widely performed and appreciated, and ranges from small popular pieces to 'Rock Sonatas' (his creation), instrumentals, concertos, symphonic and electronic compositions. His latest music has developed from this into what he now terms a new "Multi-Dimensional" music. Hellewell also founded the highly-successful "Mister D" Music Academy, which teaches his own and classical music. An essential feature of his music is that, although of serious intent and content, the works are approachable for both players and audiences, and are compatible, and indeed complimentary, to the standard, well-loved classical music repertoire. In September 1990 Hellewell travelled to Peking at the invitation of the Central Broadcasting Symphony Orchestra and the Central Conservatory of Music. Here he conducted and directed a highly-successful series of concerts, lectures and masterclasses of his music. This was broadcast on TV and radio. His new Multi-Dimensional Music was greatly appreciated by Chinese audiences, musicians and students. Forbidden Symphony (1990-92), a large-scale symphonic work for orchestra, chorus and instrumental soloists, was inspired by his visit to Peking and particularly by The Forbidden City. In 1991, David Hellewell's protégé, John Brogden, founded M-D Music Productions to record and produce Hellewell's music. In 1996, John set up and designed mdmusic.com to further promote David's music. Hellewell has also created a unique garden at his home in Bournemouth, which, like his music, combines classical, modern and oriental ideas and aesthetics. The garden has been featured in many magazines (eg. Homes & Gardens) and is open to the public. Read the 'Peking Journal' - A journal by David Hellewell of his visit to Peking, China, for a festival of his music, at the invitation of the Peking Central Conservatory and the Peking Central Broadcasting Symphony Orchestra. Article written by Hellewell for the Libertarian Alliance.